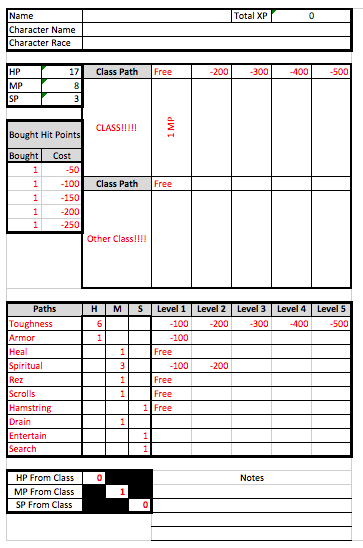 Click the above link to download the current blank character sheet, including item tags specifically to be used for Soulbound magic items. Remember, items need to be stamped by us, or signed by a GM to be official. You will notice that there is some red text on the character sheets, these are all examples of how to fill the sheet in. All of the red text should be removed and filled in with your own. When filling out hit points bought, you want to fill it out as 1 in each new line. If you fill it out as 1, 2, 3, 4, 5, then it will foul up the math in the HP, MP, SP section. Do not tamper with the HP, MP, SP section, as it will do all of the math for you. You will notice that, after the names of the path, you have an option to fill in HP, MP, or SP. This is for both the points awarded when you choose the path, as well as points that the path itself gives you as you level it. As you can see in the example, this person has taken Toughness and has it at Level 5. This means it grants them 1 HP when they choose the path, and 1 per level, to a total of 6.